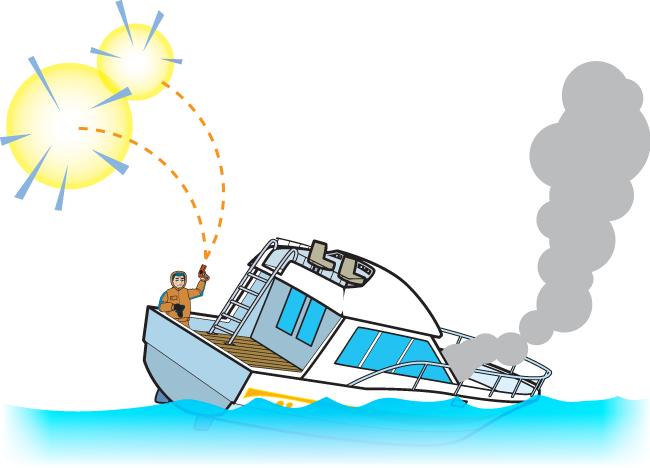 A visual distress signal (VDS) is any device designed to show that your boat is in distress and help others locate you. A wide variety of signaling devices, both pyrotechnic and non-pyrotechnic, can be carried to meet the requirements of the regulation. Visual distress signals may only be used in emergency situations. Regulations require all recreational boats operating on U.S. coastal waters, including the Great Lakes, the territorial seas and those waters directly connected to the Great Lakes and the territorial seas, up to a point where the waters are less than two miles wide, and boats owned in the United States when operating on the high seas to be equipped with visual distress signals. The regulation states "No person in a boat shall display a visual distress signal on water to which this subpart applies under any circumstances except a situation where assistance is needed because of immediate or potential danger to the persons aboard."